Yale Environment 360: Unless we change the way we live, the Earth’s coral reefs will be utterly destroyed within our children’s lifetimes, says marine scientist JEN Veron. Over the past decades, there have dozens of articles in the media describing dire futures for coral reefs. 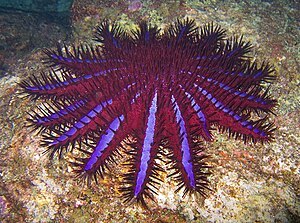 In the 1960s and ’70s, we were informed that many reefs were being consumed by a voracious coral predator, the crown-of-thorns starfish. In the 1980s and ’90s, although these starfish still reared their thorny heads from time to time, the principal threats had moved on — to sediment runoff, nutrients, overfishing, and general habitat destruction. For me, an Australian marine scientist who has spent the past 40 years working on reefs the world over, these threats were of real concern, but their implications were limited in time or in space or both. Although crown-of-thorns starfish can certainly devastate reefs, the impacts of sediments, nutrients and habitat loss have usually been of greater concern, and I have been repeatedly shocked by the destruction I have witnessed. However, nothing comes close to the devastation waiting in the wings at the moment. You may well feel that dire predictions about anything almost always turn out to be exaggerations. You may think there may be something in it to worry about, but it won’t be as bad as doomsayers like me are predicting. This view is understandable given that only a few decades ago I, myself, would have thought it ridiculous to imagine that reefs might have a limited lifespan on Earth as a consequence of human actions. It would have seemed preposterous that, for example, the Great Barrier Reef — the biggest structure ever made by life on Earth — could be mortally threatened by any present or foreseeable environmental change. Yet here I am today, humbled to have spent the most productive scientific years of my life around the rich wonders of the underwater world, and utterly convinced that they will not be there for our children’s children to enjoy unless we drastically change our priorities and the way we live. A decade ago, my increasing concern for the plight of reefs in the face of global temperature changes led me to start researching the effects of climate change on reefs, drawing on my experience in reef science, evolution, biodiversity, genetics, and conservation, as well as my profound interests in geology, palaeontology, and oceanography, not to mention the challenging task of understanding the climate science, geochemical processes, and ocean chemistry. When I started researching my book, A Reef in Time: The Great Barrier Reef from Beginning to End (Harvard, 2008), I knew that climate change was likely to have serious consequences for coral reefs. But the big picture that gradually emerged from my integration of these disparate disciplines left me shocked to the core. In a long period of deep personal anguish, I turned to specialists in many different fields of science to find anything that might suggest a fault in my own conclusions. But in this quest I was depressingly unsuccessful. The bottom line remains: Science argues that coral reefs can indeed be utterly trashed in the lifetime of today’s children. That certainty is what motivates me to spread this message as clearly, and accurately, as I can. So what are the issues? Most readers will know that there have been several major episodes of mass bleaching on major reef areas worldwide over the past 20 years. In the late-1980s when the first mass bleaching occurred, there was a great deal of concern among reef scientists and conservation organizations, but the phenomenon had no clear explanation. Since then, the number and frequency of mass bleachings have increased and sparked widespread research efforts. Corals have an intimate symbiotic relationship with single-celled algae, zooxanthellae, which live in their cells and provide the photosynthetic fuel for them to grow and reefs to form. The research showed that this relationship can be surprisingly fragile if corals are exposed to high light conditions at the same time as above-normal water temperatures, because the algae produce toxic levels of oxygen, and excessive levels of oxygen are toxic to most animal life. Under these conditions, corals must expel the zooxanthellae, bleach, and probably die or succumb to the toxin and definitely die. A tough choice, one they have not had to make at any time in their long genetic history. We tend to think of temperature in terms of our day-to-day comfort level. We don’t have to be told that atmospheric temperature shows huge swings and variations from day to night, among seasons, and cyclically on other scales. Early critics of global warming used this variability to argue that there was no evidence for overall thermal increases. This missed the point and delayed our recognition of the true problem because atmospheric temperature is only a minor part of the Earth’s thermal picture. By far the most important mobile heat sinks on the planet are the oceans. As the greenhouse effect from elevated CO2 has increased, the oceans have absorbed more heat. The surface layers are affected most as mixing to the depths can take hundreds of years. Large ocean masses such as the Indo-Pacific Warm Pool do not continue to warm further, but rather they broaden and deepen. Now they commonly become so large that their outer edges are pulsed onto the continental margins, where waters are warmed further. This creates the mortal dilemma for corals — to expel or not to expel their oxygen-producing zooxanthellae. Scientists don’t need a pocket calculator to conclude that compressing the time periods between events in this way will prevent recovery: If we do not take action, the only corals not affected by mass bleaching by 2050 will be those hiding in refuges away from strong sunlight. But there is more bad news. 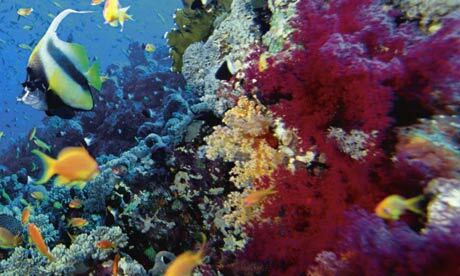 A decade or so ago, we thought that mass bleaching was the most serious threat to coral reefs. How wrong we were. It is clear now that there is a much more serious crisis on the horizon — that of ocean acidification. This will not only affect coral reefs (although reefs will be hit particularly hard), but will impact all marine ecosystems. The potential consequences of ocean acidification are nothing less than catastrophic. The ultimate culprit is still CO2 but the mechanism is very different. Normally there is a balance between CO2 in the atmosphere and its derivatives in surface waters of the ocean. As with temperature, the oceans act as a huge repository, absorbing and buffering any excess CO2 in the atmosphere. For this process to be efficient the oceans must have time for mixing to occur between its different layers, renewing the surface buffers from below. When CO2 increases too rapidly, these chemical reactions can falter, altering the balance of the buffers and gradually allowing the oceans to become less alkaline. All organisms that produce calcium carbonate skeletons (including shells, crabs, sea urchins, corals, coralline algae, calcareous phytoplankton, and many others) depend on their ability to deposit calcium carbonate, and this process is largely controlled by the prevailing water chemistry. As alkalinity decreases, precipitation of calcium carbonate becomes more and more difficult until eventually it is inhibited altogether. The potential consequences of such acidification are nothing less than catastrophic. In my book, I examine the events that led up to each of the five mass extinctions in Earth’s history. Corals offer a unique insight into the past, both because they have been around for most of the history of life on Earth and also because they readily fossilize. I examine the theories offered to explain these global extinctions and find that ocean acidification is the only explanation which fits the evidence well. Ocean acidification has played a major part in the marine devastations which took place in those ancient times. A particularly galling aspect of the past four mass extinction events (very little is known about the first) is that, following them, reefs disappeared — not just for a few tens of thousands of years, but for millions of years — long after adverse climatic conditions may have returned to benign levels. One of the characteristics of acidification is that while it can be initiated by high CO2 levels over relatively short periods, there are no short-term geochemical fixes to reverse the process. Reversal can take place only through the immensely slow weathering and dissolution processes of geological time, processes that take hundreds of thousands to millions of years. Ocean physics dictates that we will observe the effects of acidification in colder and deeper waters before it spreads to shallower tropical climes. The early stages of acidification have now been detected in the Southern Ocean and, surprisingly perhaps, in tropical corals. On our current trajectory of increasing atmospheric CO2, we can expect that by 2030 to 2050 the acidification process will be affecting all the oceans of the world to some degree. At that point, the relatively cool, deep-water tropical regions that have offered refuges to corals from temperature stress will be those most affected by acidification. No doubt different species of coral, coralline algae, plankton, and mollusks will show different tolerances, and their capacity to calcify will decline at different rates. But as acidification progresses, they will all suffer from some form of coralline osteoporosis. The result will be that corals will no longer be able to build reefs or maintain them against the forces of erosion. What were once thriving coral gardens that supported the greatest biodiversity of the marine realm will become red-black bacterial slime, and they will stay that way. Another concept of great importance is that of commitment — a word climatologists use only too often. Many of the consequences of our current actions cannot yet be seen, and yet the Earth is already committed to their path. This delayed reaction is due to the inertia of the oceans, both thermal and chemical. The greenhouse gases we produce today will take a number of decades (and sometimes more) to unleash their full fury, but their effects are unavoidable and unstoppable. We cannot afford to wait until the predictions of science can be totally verified, because by that time it will be too late. How many of us wish to explain to our children and children’s children that the predictions were there but we wanted confirmation? Coral reefs speak unambiguously about climate change. They survived Ice Age sea-level changes of 120 meters or more with impunity. They once survived in a world where CO2 from volcanoes and methane was much higher than anything predicted today. But that was over 40 million years ago, and the increase took place over millions of years, not just a few decades, time enough for ocean equilibration to take place and marine life to adapt. This is not what is happening today. Ponder these facts: The atmospheric levels of CO2 we are already committed to reach, no matter what mitigation is now implemented, have no equal over the entire longevity of the Great Barrier Reef, perhaps 25 million years. And most significantly, the rate of CO2 increase we are now experiencing has no precedent in all known geological history.